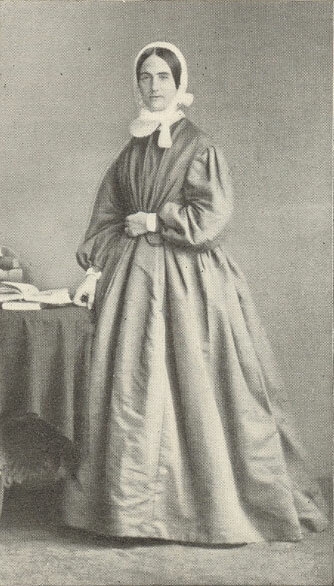 Elizabeth Catherine Ferard was encouraged by Bishop Archibald Tait of London to visit deaconess institutions in Germany, notable at Kaiserswerth am Rhein. Three years later, in November 1861, she and a group of women dedicated themselves “to minister to the necessities of the Church, as servants in the Church”. On July 18, 1862, Elizabeth received a deaconess license from Bishop Tait, making her the first deaconess in the Church of England and in the Anglican Communion. She went on to found a community with a dual vocation of being deaconesses and religious sisters, working first in a poor parish in the King’s Cross area of London, and then moving to Notting Hill in 1873. When her health failed, she passed on the leadership to others and died on Easter Day in 1883. “Deaconesses have, according to the apostolical regulations, the office of serving the Christian congregation as Phoebe served the Church at Cenchraea. To them is committed the care of the sick, the poor, the education of your children, and generally the help of the needy of whatever kind. And also it is their office to be helpers, either directly or indirectly, of the ministers of the Church. Almighty God, you have surrounded us with a great cloud of witnesses: Grant that we, encouraged by the good example of your servant Elizabeth Ferard, may persevere in running the race that is set before us, until at last we may with her attain to your eternal joy; through Jesus Christ, the pioneer and perfecter of our faith, who lives and reigns with you and the Holy Spirit, one God, for ever and ever. Amen.